WASHINGTON (AP) — The Justice Department faces a Monday deadline to provide lawmakers some evidence of President Donald Trump’s unproven assertion that his predecessor wiretapped his New York skyscraper, a claim that has left Trump increasingly isolated within his own administration. 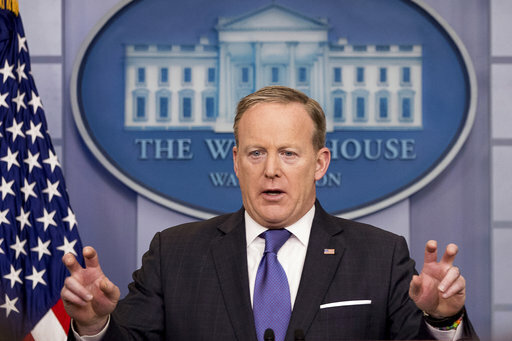 White House spokesman Sean Spicer tried to soften Trump’s assertions on Monday, saying the president “doesn’t really think that President Obama went up and tapped his phone personally.” He also said the president wasn’t using the term wiretapping literally in his provocative March 4 tweets and was instead broadly referring to surveillance. Trump’s accusations against Barack Obama came amid a swirling political controversy surrounding his associates’ possible ties to Russia. The FBI is investigating Trump associates’ contacts with Russia during the election, as are House and Senate intelligence committees. The White House has asked those committees to also investigate Trump’s allegations against Obama. The House committee has turned the matter back on the Trump administration, setting a Monday deadline for the Justice Department to provide evidence. Spicer said he expected the Justice Department to comply with that request, but added that Trump did not order the department to do so. The White House has thus far provided no information to back to Trump’s assertion, leaving his aides in the awkward position of trying to defend their boss’ unproven claims. Conway, when asked about Trump’s assertions, appeared to point toward the recent WikiLeaks release of nearly 8,000 documents that purportedly reveal secrets about the CIA’s tools for breaking into targeted computers, cellphones and even smart TVs. FBI Director James Comey has privately urged the Justice Department to dispute Trump’s claim but has not come forward to do so himself. James Clapper, who was Obama’s director of national intelligence, has said that nothing matching Trump’s claims had taken place. pyright 2017 The Associated Press. All rights reserved.